Professionally-printed copies of national reports, if available (indicated in the list), may be purchased from the Center in packages of 25. 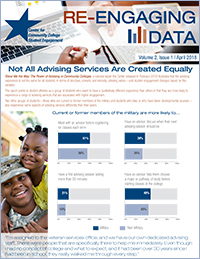 Volume 16, Issue 1 features examples of member colleges sharing their data internally and externally, highlights the experience of a member college team that attended a Center Student Success Institute, and explains exclusionary criteria the Center’s research team uses when analyzing data. Volume 15, Issue 2 features video of several students describing their experiences with Guided Pathways, highlights a member college connecting engagement data with workplace expectations, and shares the venues where Center staff will be presenting around the country throughout the fall. Volume 15, Issue 1 previews a special report on academic advising the Center is releasing in February 2018, highlights a member college using student voices in a unique way, and introduces the SENSE 2018 Pathways special-focus module. Volume 14, Issue 2 introduces new Center-created focus group discussion guides, explores the rationale for including student success courses in the SENSE sampling frame, and highlights a member college examining student enrollment patterns in a similar manner as Center researchers did for the Even One Semester report. Volume 14, Issue 1 previews a special report on student financial health the Center is releasing in February 2017, features the new Center-created Pathways Toolkit, and highlights a member college using Center data for accreditation purposes. Volume 13, Issue 2 features the Center’s newly updated Accreditation Guide, describes the importance of conducting cognitive interviews, and highlights a member college working to provide professional development to help faculty engage students beyond the classroom. Volume 13, Issue 1 previews the Center's upcoming national report and features a college using CCSSE results in its assessment of general learning outcomes. Volume 12, Issue 2 highlights encouraging news about student aspirations and features a member college using CCSSE data as a measure of critical thinking. Volume 12, Issue 1 previews an upcoming Center report that reviews a decade of CCSSE data and also offers an in-depth discussion of the Custom Report Requests page of the online reporting system. Volume 11, Issue 2 announces two new Center leaders and highlights an initiative focused on the successful transfer and college completion of Latino students. Volume 11, Issue 1 announces major transitions at the Center, including the retirement of its founding director and the wrapping up of several grant-funded projects. Volume 10, Issue 2 features Academic Advising: The Key to Student Success, a monograph edited by Terry O’Banion that includes Center data and reporting, and celebrates Center leader Angela Oriano for her new role. Volume 10, Issue 1 announces the Center’s partnering with Excelencia in Education and introduces a new grant-funded Center project exploring the role of part-time faculty. Volume 9, Issue 2 features Students Speak — Are We Listening? Starting Right in the Community College, a book and accompanying DVD capturing student voices from years of Center focus groups. Volume 9, Issue 1 introduces the Center’s High-Impact Practices Initiative. Volume 8, Issue 3 highlights the Center’s commitment to the college completion agenda. Volume 8, Issue 2 includes tips on using Center survey results in the accreditation process. Volume 8, Issue 1 announces the transition to the Center’s new name. Volume 7, Issue 4 features findings from focus groups conducted with entering students at SENSE pilot colleges. Volume 7, Issue 3 previews the year’s upcoming presentations and workshops. Volume 7, Issue 2 introduces the Starting Right work. Volume 7, Issue 1 reports on the 2007 CCSSE Workshop. Volume 6, Issue 4 provides an update on Achieving the Dream from Project Director Byron McClenney. Volume 6, Issue 3 recognizes four MetLife Foundation Best-Practice Colleges for their exemplary performance in fostering students’ relationships with faculty, staff, and their peers. Volume 6, Issue 2 recognizes 2006 CCSSE high-performing colleges. Volume 6, Issue 1 reports on the 2006 CCSSE Workshop. Volume 5, Issue 7 recognizes Sinclair Community College, a 2005-2006 MetLife Foundation Best-Practice College. Volume 5, Issue 6 recognizes St. Philip's College, a 2005-2006 MetLife Foundation Best-Practice College. Volume 5, Issue 5 recognizes Parkland College, a 2005-2006 MetLife Foundation Best-Practice College. Volume 5, Issue 4 recognizes Gainesville State College, a 2005-2006 MetLife Foundation Best-Practice College. Volume 5, Issue 3 promotes the 2006 CCSSE Workshop and new resources. Volume 5, Issue 2 recognizes the four 2005-2006 MetLife Foundation Best-Practice Colleges for their exemplary performance in student retention. Volume 5, Issue 1 provides descriptive results from the first national administration of CCFSSE. Volume 4, Issue 9 offers a preliminary look at the relationship between student engagement results and student outcomes in Florida community colleges. Volume 4, Issue 8 recognizes Valencia Community College, a 2004-2005 MetLife Foundation Best-Practice College. Volume 4, Issue 7 recognizes Santa Fe Community College, a 2004-2005 MetLife Foundation Best-Practice College. Volume 4, Issue 6 recognizes San Juan College, a 2004-2005 MetLife Foundation Best-Practice College. Volume 4, Issue 5 promotes the 2005 CCSSE Workshop and upcoming conference sessions. Volume 4, Issue 4 recognizes Housatonic Community College, a 2004-2005 MetLife Foundation Best-Practice College. Volume 4, Issue 3 recognizes the four 2004-2005 MetLife Foundation Best-Practice Colleges for their exemplary performance in student retention. Volume 4, Issue 2 responds to feedback from the field regarding CCSSE. Volume 4, Issue 1 describes how Oakton Community College collected faculty perspectives about student engagement and experiences and announces the availability of CCFSSE. Volume 3, Issue 7 recognizes Skagit Valley College, a 2003-2004 MetLife Foundation Best-Practice College. Volume 3, Issue 6 examines how colleges and the field at large are using CCSSE data to focus conversations and target improvement initiatives. Volume 3, Issue 5 recognizes Northwest Vista College, a 2003-2004 MetLife Foundation Best-Practice College. Volume 3, Issue 4 recognizes Muskingum Area Technical College, a 2003-2004 MetLife Foundation Best-Practice College. Volume 3, Issue 3 recognizes LaGuardia Community College, a 2003-2004 MetLife Foundation Best-Practice College. Volume 3, Issue 2 recognizes the four 2003-2004 MetLife Foundation Best-Practice Colleges for their exemplary performance in student retention. Volume 3, Issue 1 describes how Surry Community College incorporated its CCSSE results into the accreditation process. Volume 2, Issue 7 announces the launch of the new CCSSE website and highlights a new national report. Volume 2, Issue 6 recognizes Montgomery College, a 2002-2003 MetLife Best-Practice College. Volume 2, Issue 5 recognizes Maui Community College, a 2002-2003 MetLife Best-Practice College. Volume 2, Issue 4 recognizes Community College of Denver, a 2002-2003 MetLife Best-Practice College. Volume 2, Issue 3 describes Richland College’s experience with the Appreciative Inquiry approach for examining CCSSE results and other data. Volume 2, Issue 2 recognizes Central Piedmont Community College, a 2002–2003 MetLife Foundation Best-Practice College. Volume 2, Issue 1 recognizes the four 2002-2003 MetLife Foundation Best-Practice Colleges for their exemplary performance in student retention. Volume 1, Issue 2 introduces the MetLife Foundation Best-Practice College series. Volume 1, Issue 1 provides introductory information about CCSSE. Volume 5, Issue 2 features The Data Narrative: Making Results Relevant to a Greater Audience. Volume 5, Issue 1 features Building Connections, Building Success. Volume 4, Issue 2 features using focus group work to dig deeper into the student experience. Volume 4, Issue 1 features CCSSE Texas Small Colleges Consortium members sharing stories of progress. Volume 3, Issue 2 highlights results from Clarendon College. Volume 3, Issue 1 highlights CCSSE's ongoing work with the Texas Small Colleges Consortium. Volume 2, Issue 2 highlights results from Texas State Technical College West Texas. Volume 2, Issue 1 welcomes Texas Small Colleges back for CCSSE 2006. Volume 1, Issue 6 highlights results from Hispanic serving colleges for CCSSE 2004. Volume 1, Issue 5 invites Texas small colleges back for CCSSE 2006. Volume 1, Issue 4 highlights upcoming CCSSE presentations at the TAIR conference. Volume 1, Issue 2 highlights the HSI/HACU consortium for CCSSE 2004. Volume 1, Issue 1 highlights the Texas Small Colleges consortium for CCSSE 2004. Volume 3, Issue 2 provides information about a special study and related survey discounts. Volume 3, Issue 1 reports on the 2010 Entering Student Success Institute. Volume 2, Issue 3 presents 10 resolutions for 2010. Volume 2, Issue 2 announces SENSE online reporting system expansion. Volume 2, Issue 1 recognizes colleges' progress on their 2009 Entering Student Success Institute action plans. Special Edition Fall 2008 highlights the first Entering Student Success Institute. Volume 1, Issue 2 announces the qualitative portion of the entering student survey project. Inaugural Issue, Volume 1, Issue 1 introduces the Survey of Entering Student Engagement (SENSE).